There were diseases that wiped out many of the people who had the skills to make clothing like this in the early days. First there was starvation followed by introduced diseases, until right up to the 1930s. And people began changing their style of clothing, probably as a result of that. This is a young woman’s fancy parka for festivals and ceremonies. The U-shaped bottom edge is a traditional feminine style that is no longer made. The white fur is from the belly of the reindeer, and the brown fur is from its other parts, including leg skins used to make the vertical panels. The seams and bottom are trimmed with wolverine fur. Along the lower edge are a strip of alder-dyed skin, lines of brown fur and red yarn, and a triangular patch of bleached sealskin. Elders said that the fine work shows the young woman’s skill as a seamstress. Ron Brower: This looks like it is a parka made out of reindeer skin. These (indicates vertical trim below waist) look like that’s the legs [leg skin]. And some of this is the belly part (indicates white skin of body of parka), unless this is – qatiqtaaguruq [it is white]. The light skin was sought after from Siberia, because the reindeer is a much lighter color than caribou. And so it would be sought after it in trade. Jane Brower: Narraaŋanik [from the belly]. Ron Brower: Tainna qupaŋaruanik uvani Utqiaġviŋmi atigit qupaŋasurut. Ron Brower: This is wolverine trimming with caribou belly (indicates light colored skin of parka body) and leggings (indicates dark colored skin down center of parka body). And this is cut from the body of the caribou (indicates dark colored skin of sleeves), the arms. Aron Crowell: And how about the embroidery around the bottom? How’s that made? Ron Brower: This (indicates decorative band at hem of parka) is dyed caribou skin. This (indicates trim at bottom hem of parka) is the back of the wolverine that’s been dyed. Karen Brewster: Where would this style have come from? Ron Brower: There’s a number of different designs. These were probably either traded or made up in the area, in the North Slope. Karen Brewster: Is this something you would have seen in Barrow? Jane Brower: I’ve never seen any of that kind of parka. Ron Brower: These are too old. These are before our generation of time . . . that they would have made these. Doreen Simmonds: What I understand is that our people wore this kind a long time ago. It was traditional to wear this kind (indicates rounded bottom hem of parka). Isn’t that right? And then we slowly changed to that way (indicates straight bottom hem of parka), flat. Flat. Ron Brower: This is definitely the North Slope style. Ron Brower: Looking at ruff this would be everyday wear. Jane Brower: Fancy parka. Wedding parka? Aġnam atigiŋa. Nasaŋa aġnam allausuuruq aŋutim nasaŋaniñ. Aron Crowell: And this is a young woman’s parka? Aron Crowell: You said maybe a wedding parka. Jane Brower: Depends on the [ ]. Kenneth Toovak: It’s just like a young lady has to wear a fancy garment. Ron Brower: When they become eligible for marriage. Kenneth Toovak: Yeah. Just like when you’re going to the ceremony, you have to put suits on today. So back in those days, this type of garment is the ceremony-type parka. Before they got those cloth and material in the old days. So, you see there’s a special parka that they wear, when there’s a gathering or for special whatever. Ron Brower: They had a lot of festivals where when people were gathering. And they put their best dress on when they had their ceremonies and gathering of different groups or clans. Cause when they gather, you’re looking for a spouse, in those days. And one offor women, one of the attributes was their skill in sewing. So the fancier clothing that you make, you’re considered a highly prized woman. Aron Crowell: Why do you think people changed the style? Ron Brower: They slowly changed from fancy style clothing to the type of clothing we’re using today because of the ease of access of cloth. And it was easier to switch to cloth. And from animal clothing to this kind of clothing there’s been a change. And also the change in the population. 1. According to Martha Aiken, this type of parka is called qusuŋŋaq, an “outer parka fur outside.” It was made from any kind of skin with the fur side facing out and made fancy or plain. 2. According to Martha Aiken, this parka does not have the right cut—not ankle-length, not straight bottom—and is not fancy enough to be an atqaġun [woman’s dress parka] from Barrow. An atqaġun—sometimes called a siksrigaat—is ankle length with a straight bottom hem. It is usually made mostly from squirrel with qupak [fancy trim] around the bottom, wolverine nigra [tassels], a manusiñiq [parka gore] at the sides of the neck on the front and sometimes the back, a squirrel head nasaq [hood] with white trim, and a sunshine (wolverine) isiġvik [fur ruff]. 4. According to Martha Aiken, “styles” refers to making fancy style parkas, and “sickness” refers to the 1918 flu epidemic. 5. According to Martha Aiken, it was hard to acquire cleaned skins and when ready-cleaned skins (eg.., calf skin) became available it was easier to make parkas. The sudden changes due to the loss of lives from the 1918 flu epidemic and due to the availability of ready-made skins led to fancy parka trims not being made as skillfully anymore. This happened not just because people died, but because changes came and people changed. In the past, some fancy parkas trims were embroidered with dyed long caribou neck-hair. There are some Elders who know about this type of trim and the use of white caribou belly-skin like Bertha & Mary Lou Leovitt in Barrow. Reindeer are semi-domesticated caribou and were historically acquired in trade from Chukchi herders on the Siberian side of Bering Strait. Starting in 1892, the U.S. government established reindeer herds in northwest Alaska. Their light-colored fur is highly valued. (2) Starting in 1892 the U.S. government established reindeer herds in northwest Alaska. The term qusuŋŋaq is used for a parka worn with the fur facing out. 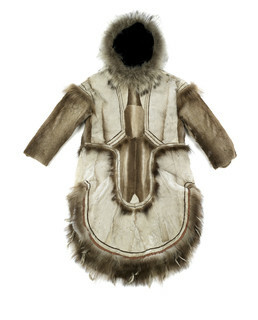 According to Martha Aiken, Ronald Brower Sr., Jane Brower, Doreen Simmonds, and Kenneth Toovak, the white fur on this parka is from the belly of the reindeer, and the brown fur is from its other parts, including leg skins used to make the vertical panels. The seams and bottom are trimmed with wolverine fur. Along the lower edge are a strip of alder-dyed skin, decorative lines of brown fur and red yarn, and a triangular patch of bleached sealskin. Elders added that the fine work shows the young woman’s skill as a seamstress. When people gathered at festivals they were looking for marriage partners, and if a woman could sew clothing like this she would be highly prized. 1. Bruce, “Report [Fiscal Year 1892–93],” 110; Dall, Alaska and Its Resources, 22, 141; Fitzhugh and Crowell, eds., Crossroads of Continents, 214; Michael, ed., Lieutenant Zagoskin’s Travels, 110; Murdoch, Ethnological Results of the Point Barrow Expedition, 110–11, 113, 118–20; Nelson, The Eskimo about Bering Strait, 30–35; Ray, “The Eskimo of St. Michael and Vicinity,” 35–37; Simpson, “Observations on the Western Eskimo,” 244; Thornton, Among the Eskimos of Wales, Alaska, 34. 2. Gordon, “Notes on the Western Eskimo,” 78; Michael, ed., Lieutenant Zagoskin’s Travels, 110; Ray, “The Eskimo of St. Michael and Vicinity,” 35.